Blogger Prom: Getting the Hollywood Confidential look . . . 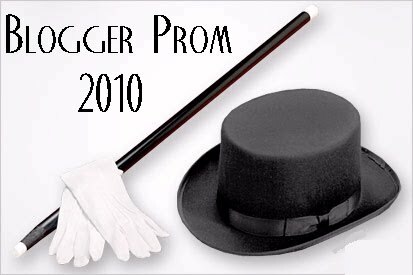 The prom is only two weeks away, yowza! (The BloggerProm Committee can't believe how fast time flies too!) Still having trouble getting that theme-appropriate look? Here's some pointers to get your Hollywood Confidential glam on for both fellas & dames, from our salon sponsor Studio DNA. No matter the length, to achieve any style from the era, you will need to preset your hair in pincurls. For more specific instructions on how to achieve a pincurl, click here. Setting your hair is best done the night before but you can use hot rollers or a curling iron to help set your curls a few hours prior to the event. Spraying your curls with a hairspray that is malleable but has memory is best. If you want tight curls, then set your hair when it is damp. If you want loose curls, then set your hair when it is dry. Heat application can help hasten the process, but don’t get impatient. Once your hair has set, release the curls by removing the pins. Now you can style. Be sure to use a fine comb or a rat tail comb to help smooth out sections. Remember to spray to set your style. Dark eyeliner contouring the eye and accenting the outside points help frame the eyes so they stand out. Accentuate the top lashes over the bottom lashes. False eyelashes add extra glamour. Women typically managed their own eyebrows by tweezing. As a result, you will notice most women had to fill in their brows to ensure the perfect arch. Eyebrows were very feminine though very strong. Red full lips. Be sure to contour the lip with a color that matches the lipstick. Women didn’t typically have multiple colors in their make up kits so your lip color should be flat. If you are feeling particularly exotic, add a beauty mark. They were all the rage thanks to Marilyn Monroe. Remember, make up was expensive for most women and powder was often the way they accomplished their finished looks. The powder was more often, lighter than a woman’s natural complexion. Watch an episode of Mad Men to see the many variations on the exact same shape. With your hair still damp, apply gel liberally to the front of your hair from root to shaft. Then apply some gel to the back. With a fine toothed comb, slick the hair straight back. Let the hair rest so you can start to see the natural part. From the natural part, begin to separate the hair, slicking the top to the side and then back. The sides should be combed tightle back. If you have short hair, just be sure that it is tailored and tight. It wasn’t until the mid-sixties that we let our hair down (literally). For more about the history of the Hollywood Confidential styles and how celebrities, then and now, are rocking them out, read the rest of Studio DNA blogpost here (it's also got additional videos with nice DIY style tricks). We look forward seeing you all in your fabulous 'dos and glamorous get-ups very soon!